A newborn Chinese baby boy had died after his head was dragged into the floor by unknowing medical personnels as they transfer his mother to the surgery. While wheeling the woman in labor, nobody seemed to notice that the baby had already came out and its head had been dragged along the floor. 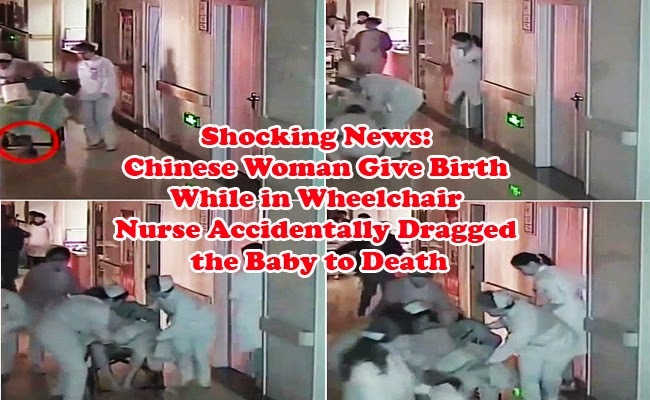 The baby had been reported to have sustained fatal head injuries as the mother, Shang Shao, gave birth while in a wheelchair. Shang Shao was rushed to the hospital in Luoyang City, Henan province in China due to labor pains. Only 7 months pregnant, Shang’s water broke which prompted her partner, Pan Mai to bring her in the hospital. Shang was already in evident labor but the doctor decided that she must undergo caesarean section. The nurses assisted her in a wheelchair then pushed her towards surgery not knowing that the head of the baby was already out. It was not until a few feet when someone noticed a trail of blood on the floor. They immediately attended to the baby but had been too late as the baby already suffered major head injuries which lead to intracranial hematomas. The baby was rushed to the neonatal intensive care unit but soon died as the blood vessels between the brain and the skull had already raptured. The family plans to sue the hospital. Pan expressed that he was devastated and it was the worst traumatic day in his life. The hospital’s spokesperson said that the doctor who had ordered the caesarian section lacked experience and should have talked with a senior doctor first for consultation before giving such order. While the doctor had been suspended, the nurses faced serious disciplinary actions. They were demoted and given a stern warning as they should not have moved the patient to the wheelchair.